We support diverse books! Scholarship open to one author who writes children's books with a voice of diversity. Email cbwla2012@gmail.com to request scholarship application. This discount is only available for our returning Story Sprouts authors. Code required. Join us for a Writers' Marathon! This is high impact, high intensity writing at its best. You will be challenged. You will feel a rush. For just over ten hours, you will be fed high quality writing lessons on the topic of Conflict, which you will turn into fiction and non-fiction stories on your own and in writing groups by following new, original Story Sprouts exercises. Not for the faint of heart, this is a major commitment to yourself and your writing goals. It is a supreme mental workout, and by the end, you will have a minimum of three pieces ready for publication in our fourth annual Story Sprouts Writing Resource and Anthology. As one of our 2015 Story Sprouts Authors put it, "5,596 words today at Story Sprouts!!!! Exhausted but exhilarated. Thank you CBW–LA for putting this amazing event together." We invite you to take part in our Story Sprouts series through registration for Writing Day 2016. Every author who attends this workshop will walk away with a bevy of inspiration and writing lessons, an expanded writing community, and a publication in two books (a group novella and the full Story Sprouts Writing Resource and Anthology) with YOUR name—and story—within one year of completing the workshop! See our first two books: Story Sprouts Writing Resource and Anthology (Volume One and Volume Two: Voice). Our third and fourth books will be published in late 2015 and early 2016. Stay tuned for links. CBW-LA Founder and President Nutschell Windsor and Publications Director Alana Garrigues lead attendees on a whirlwind adventure through the writing process, complete with prompts, tips, games, time for reflection and revision ... along with food and socializing along the way! This is Nutschell's fourth year and Alana's third facilitating the highly rated workshop that former authors have called "an awesome and fun day," "spectacular," "delightfully surprising," "encouraging and motivating," and "well done." Children's Book Author J. Enderle said of Story Sprouts: Voice, "Applause for both the authors who gathered all this information and put it in understandable context as well as to the workshop writers who allowed their spur-of-the-moment work to be used as learning examples. Impressive! Definitely worth the money." This year's theme is CONFLICT! We will teach you how to move your story forward with a plot that employs just the right amount of tension, twists and turns to keep your reader on the edge of their seats, aching to turn the page for more information. This workshop is geared toward children's book writers, and you will explore Middle Grade and Young Adult levels, but it is open to anyone. The lessons will carry across genres and audiences. We only ask that you come prepared to write at a PG-13 level or below. Every year we innovate our approach, based on self-assessments and workshop evaluation forms. Look for a streamlined collection process ... and more goodies and innovations that we'll announce as we finalize details. By the end of the workshop, you will have a minimum of three pieces ready for publication in the group novella and the CBW-LA Story Sprouts Anthology, Story Sprouts: Conflict. All submissions will go through thorough developmental, content, line and copy editing prior to publication. Register early. Space is limited! Payment required to confirm your reservation. *Early check-in opens at 7:45 a.m. Arrive early and enjoy a light continental breakfast and some chit chat while you set up your writing space. *Workshop will start PROMPTLY 8:30 a.m.
*There will be a group photo, so we'll provide the shirt, but you may want to bring something to freshen up after lunch. *PLEASE BRING A LAPTOP if possible! We welcome your handwritten submissions and we will transcribe them for you, but it will be easier for you to edit and revise your work on a computer. Students and Returning Authors SAVE with registration code! 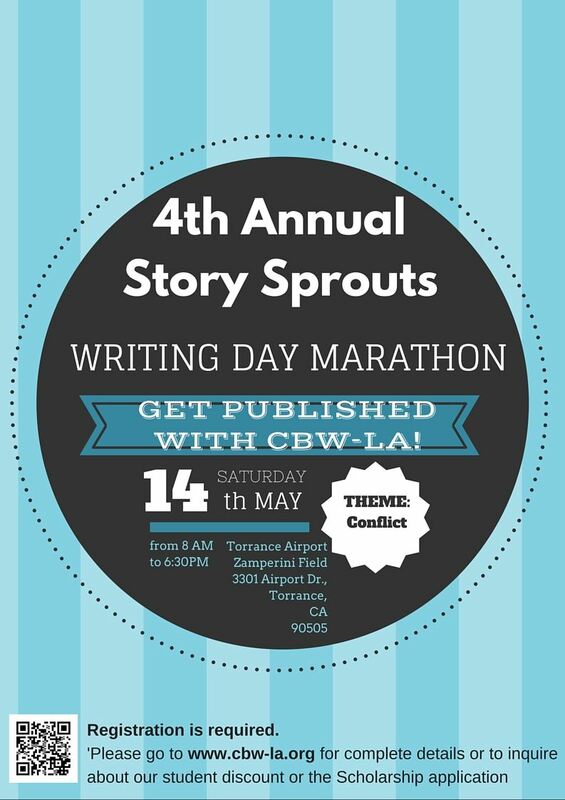 Send proof of student status to cbwla2012@gmail.com to request discount code and register at Story Sprouts alumni price for only $125! Returning authors, if you misplaced your email discount code, let us know and we'll send it your way. Email us to find out about our Diverse Voices Scholarship (open to all writers who speak from a minority voice). FREE Launch Party Celebration to toast your success! YOUR name and work in this year's Story Sprouts! 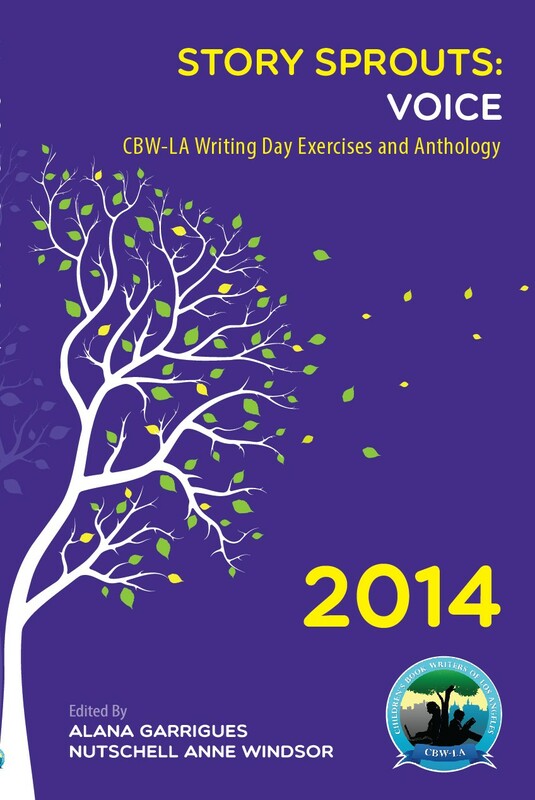 Visit www.cbw-la.org NOW to complete your online registration. We understand things come up, but we really hope to see you at the event. After all, we're saving a space for you! However, please note - if you must cancel, we offer a 50% refund until 30 days prior to event. No refund after April 14, but we will send a complimentary copy of Story Sprouts.